Fiat Chrysler Automobiles (FCA) is the world’s 7th largest automobile manufacturer,responsible for brands such as Fiat, Chrysler, Dodge, Ram, Jeep, Alfa Romeo and others. More specifically, Media Genesis works with the FCA Performance Institute on a wide range of eLearning courses each year. This division of FCA is responsible for dealer training across the U.S. Our work with the Performance Institute also extends to the Canadian and International divisions. The FCA Performance Institute creates a number of eLearning courses each year for their network of dealerships. These courses are used to keep dealership staff up to date on new products, service updates, processes and more. In the spring of 2016, FCA approached Media Genesis for production of a new course highlighting the launch and features of the 2017 Fiat Spider. FCA provided the script, basic course shell and graphical elements, voice over and image fi les. Using Articulate Storyline 2.0, Media Genesis built the course, completed full course testing, hosted a Beta review of the course and met the client’s agressive timing. A carefully executed script is essential for curriculum design. Media Genesis and FCA have worked together for years and use a successful template for identifying voice over, cue points, routines, assets and scene timing. it is used by our development team to program the course manifest for the Learning Management System (LMS). to sync the timing of imagery, on screen text, and VO with cue points. 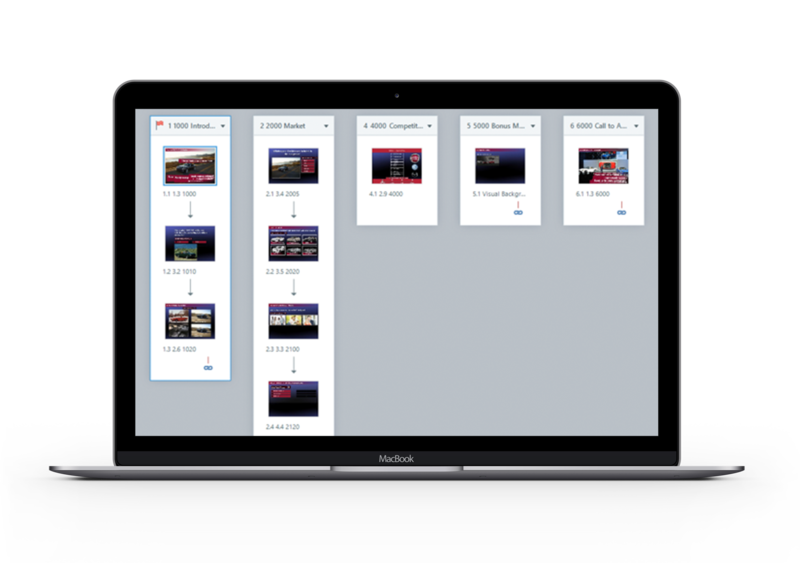 Articulate overviews each module and marks the starting scene with a red flag. Consistent identification of each module and scene is essential for proper image placement and syncing of the course. Course designers work with the Articulate triggers and conditions to time the course and program learner routines. Designers and development must work as a team to include custom java script to the build. This allows course progress to be tracked and bookmarked properly in the LMS. We use the Articulate States feature to change the state of an image or field in the course. For example, the image view may change when a learner hovers over the image or has visited it before. Important to note in this course is the integration of Flash animation in the introductory scene. FCA designers wanted to feature a shimmering, rain-dappled spider web on the course intro scene. To accomplish this, our development team used Flash animation to animate water droplets and movement of their illumination from left to right across the screen. This was then added to the Articulate build. After successful development and launch of the three courses, Media Genesis was requested to translate the courses for use in the Canadian Market into Canadian English and Canadian French Necessary styling adjustments were made for each course to account for text and image display in each of the languages. Media Genesis’ design department also provided asset translation where image based text needed to reflect the target market language.